I've been receiving several emails from you wondering when, or even if, I'm ever going to come back to Just Hungry. I just wanted to reassure you that I am. I am finally feeling well enough to start cooking again - something that is pretty critical for a food blog. It has been a very long haul, and there were times when I thought I would never be able to come back to food blogging, especially during and after my radiation therapy, which completely zapped my energy and my appetite. I have to admit that I got very depressed at times at the prospect of never regaining the urge to cook something interesting, or come up with a new recipe, ever again. But I do feel that my cooking mojo is coming back now. It helps a lot that I finally have a working kitchen, which I may show you on these pages later. I may have some issues to deal with. For instance, due to my lack of updates I may lose some of the advertising that helps to fund this site as well as Just Bento If that happens I'll have to rethink my hosting situation and so on. I do hope my advertisers do not leave me, but - well, we shall see. I've also been trying to update the software that runs this site, but I have decided that that has to wait until I've reached a higher level of energy so to speak. (Fiddling with software is tough.) The writing is what 's most important after all. Submitted by maki on 2012-11-27 21:41. I'm pulling for you! Sending nothing but optimism and love your way! I'm happy that you're feeling better now! :D Also, congrats on getting a kitchen! Cannot wait for you to be back and to be well. Sending good thoughts and wishes your way. I'm really, really glad to see you back. Although I've followed you on Twitter all this time, I still did miss you here! Aw, you know your fans are pulling for you! We're patient and kind because we want your site to be around for years and years - and that requires you to be fully better! that's so good to hear! glad you are finally feeling better. don't stress yourself about it, but i'm very much looking forward to new articles.. So good to hear from you! Take care and best of luck. Just glad to know you are okay! So glad to hear you are feeling better! I've really missed the blog updates, but take care of yourself first. Joining in on the chorus of well-wishes for you Maki! Sending lots of good energy too, just do what you need to feel better and I know we'll see you back here soon <3 Best to you! So glad to hear things are on the up, esp. health & kitchen. You have been in my thoughts and it has been reassuring to see Japan Times articles. But as other commenters have said, we're still here, please pace yourself. If the advertisers don't provide enough support, when you are ready to do some work on the site, please consider a 'give a little' system. yes, i agree! please let us know if there is a donation site for you. in the midst of your health battle and getting back to doing what you love, you shouldn't have to worry about funding. best wishes to you! Best wishes on your recovery, and looking forward to new recipes soon - and hearing all about that kitchen! Just happy to see an update from you and to know you are still out there kicking! Your audience will wait patiently! I missed you! I've been getting my fix through the Japan Times, but I'm so glad things are starting to get better for you, Maki. Additionally, your blogs are the to which ones I refer all the new foreigners in Ishikawa when they want to learn to cook Japanese food or have questions about Japanese ingredients. Take care of yourself, and we can't wait to have you back. Wonderful to hear you're on the mend. Hopeful to see your emails soon. Maki-san, we are here when you are ready. There are plenty of other posts in this site that I visited again and again (sukiyaki is one of them, the other is about tsukemono). Take care of yourself, we'll be around! So glad to see you again! 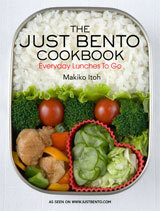 I think of you and send good thoughts, prayers and wishes every morning when I make our bento lunch to take to work. Keep getting better and we'll be here when you get back! Whew! So happy to hear from you! I was just poking around your sites to see if you had surfaced lately. So very happy to know you've come thru the worst of it. Congrats! So glad you are recovering. You've been a real inspiration for me and your recipes (both on the blog and your wonderful Just Bento book) have helped me eat healthy while recovering from my own illness. Just in case your sponsors read this, I would never have found JList or Bento&Co without this site. I love those shops now. I even sent my friend in Japan to the Bento&Co shop in Kyoto. Keep on getting better. Don't worry about us, your loyal fans. We will be here when you're ready. Always glad to here from you Maki. Have been following you since 2003 and am still here. Keep on cooking and healing. The blog and your readers can wait. We all wish you the best here from Belgium. Looking forward to your new posts Mako, but do take care of yourself too! So glad to hear you are feeling better. You have so much seasonal content, please recycle some posts that we missed or forgot; then people will get back in the habit of visiting your site. Get a partner or help to do this and it can give you energy. I miss the emails that remind me to cook good things. Ganbatte! So glad to see you! I started reading during your absence and have been hoping you were on the road to recovery! Take care of yourself, we'll be here. I commend you on all the hurdles you have jumped. Best wishes to you , hope you have a complete recovery ,and that you can do all the things you enjoy , been reading here for many years since 2005 and still reread older posts. Good luck and take care of yourself.Have a nice day. Be well. I'm overwhelmed by all your support....I literally have tears in my eyes. We love you, and want you healthy and happy, so don't rush it. Besides, as Kat and several others pointed out, there is so much content on the two sites that it's not as though we could get bored, or run out of great recipes of yours to try. Hopefully your advertisers realize this! So glad to hear that you are feeling better, thank you for everything you do, have done, and will do! Posting as a show of support to your advertisers. If you can show that zillions of people are still reading even after a long fallow period, they'd be silly to withdraw their ads, no? And, of course, best of luck in getting back up to full speed! I look forward to those kitchen photos. Ditto on what everyone else is saying --- I was so pleased to get an update email this morning and hear that you are doing better. I didn't realize you were on Twitter, or I would have followed your tweets because I have thought of you often and hoped you're feeling better and coming back soon. Hey, glad there's some good news and progress. I haven't nearly gone through everything I want to read here, and I keep looking at the ads, and plan to buy. I echo what others have said. We eagerly look forward to your posts but can wait till your energy improves. Please take care of yourself first. And if you have lost any sponsors, I'm willing to contribute through PayPal. I love your postings, and just bought your book!!! I just bought your cookbook from Amazon and then discovered your blog. I'm sorry to hear about your illness and subsequent lack of energy. But please know that what you've already shared with the world makes a difference to so many people and we're all looking forward to learning more from you. But only when you're ready to get back to it! So happy to see you on line, but your "JOB" is to stay healthy:) I'm a cancer patient too, when appetite flagged and was so...down...reading old posts sometimes perked my appetite. All the best from Los Angeles! so much love and so many good wishes to you. we are with you and welcome you back to you, most important of all to feel you are the person you know. So glad that you are getting both your appetite and energy back. You have fought a great battle, so give yourself time to rest and know that there are a lot of us out here looking forward to your returning on a more frequent basis. Sending you a cyber hug! Good to hear that you're on the road to recovery! Looking forward to reading your posts again. Glad to see an update! I too have been thinking about you and checking this blog more for updates on how you're doing than any food-related anythings. As for the advertising, put your fans to work for you :) How can we help? Clicking ads, buying things through your site, writing guest articles? Glad to hear you're starting to feel better, Maki! We have all certainly been missing you and wishing you the best. It occurs to me that, as readers and friends of Just Hungry, we have an opportunity to show our support for Maki in a small tangible way... if we visit her sponsors while she is still on the mend - perhaps by getting ourselves or our friends a cute bento accessory or two as a stocking stuffer, the traffic to sponsor sites by clicking through from Just Hungry might keep them from leaving. That's how it works, right? They keep track of where their traffic is coming from? I know I am always wishing for one or two cute kitchen toys, but I never am really willing to splurge on myself. Next payday, though, I will definitely be back to check out some of your sponsors from here, Maki! Continued best wishes!! We love you. Also, have you considered re-posting some of your seasonal content (to keep your advertisers)? Honestly, you wouldn't even have to change the pictures or anything, but there are so many articles that I forget about and it's always a nice reminder to have something like that pop up new in my rss feed. That way we get a refresher post, and you can feel like your site is drawing visitors for your advertisers. Best of luck and wishing you continuing improvement in your health. Looking forward to your upcoming blogs, but I and others enjoy your past blogs, too. They are timeless! I am glad you are beginning to feel much better. I know recovering from that is very hard, both of my in laws have gone through cancer treatments and it was a very trying and hard time for all of us. I hope you continue to regain your health. Nothing in the world is more important than you own health! I do look forward to yummy updates though!! Glad to see you're coming back. The road to recovery can be long, and difficult, but the damage it can do to one's life as one used to define it is what is sometimes the hardest to get through. It's good that you're starting to feel more like yourself, and reclaiming those parts of yourself. Wishing you the best! Love your recipes (even the ones I have to modify slightly for gluten free purposes) and can't wait to see more. I'm glad to hear this. I can't wait until you come back, and I hope you don't lose your sponsors. We have all missed you, but will patiently await your return to good health. Take care and wishing you all the best, Maki!! i never commented on any of your sites, but due to this situation, i feel compelled to do so. i'm very happy to hear that you're better! please, continue to talke good care of yourself, and take whatever time it needs to come back with all your energy restored. that's a most important thing! i can't say enough how much you inspire and help me to cook (for myself and recently, for others), to mantain a healthy life and always wanting to know more and improve! i'm dying to get your book, but since i'm in brazil it's kinda hard (and more expensive) to buy it, but i'll do it asap. please, get better and better! I'm so glad to hear you're getting better! Maki! I'm so glad to see you posting again! I hope you continue to feel better and I look forward to seeing more recipes from you, you're amazing! It's very good to hear from you. Don't worry about us, you've left us with so many recipes that we could cook for a year! Take care of yourself and we'll continue to support you! Maki! So good to hear from you and you're doing better. Cannot wait for your new posts! Your advertisers should know better than to leave. Boo... I hope everything works out! Such good news- best wishes for a continued recovery! Yay ! So glad to hear that you are feeling better and so good to hear from you. Stay strong and keep on looking after yourself. I send you all the best wishes and a virtual hug. So happy to hear from you again ! Don't worry, you have followers craving for your words. So glad to hear you are feeling better - even gladder to hear that the kitchen is calling you again! I will agree with everyone who has said this, take care of yourself first. I hope for the best and I hope that you will continue to keep up the good work once you get better. Wonderful that you are feeling quite a bit better and that you are able to enjoy your new kitchen. Not to worry about the updates. yes, I was wondering if you were coming back, however I will still be here waiting for you as I'm sure others will too! Take care of yourself first! I am still looking at the old things. I love your idea of cooking. I read my Just Bento Cookbook often and I like trying to make recipes that fit in Bentos. I really hope you are up and about soon. I had been checking continuously for a sign of yours on the websites, and I am extremely happy that you're back again. Your websites are wonderful, interesting, and mouth-watering! I really love them! Take care! So glad you're back. I'm very thankful that you're feeling healthy and that you're ready to get back into blogging! Yay! I'm so happy that you're feeling better! We've missed you and worried about you so much!